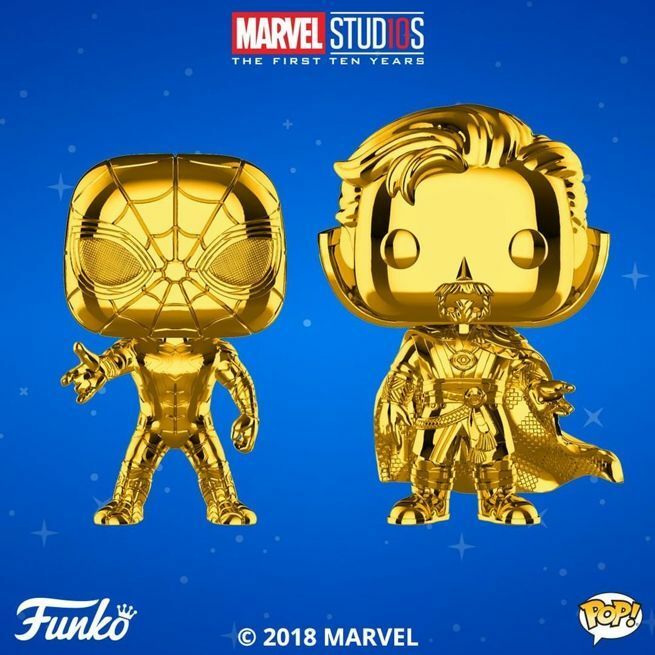 Back in July, Funko unveiled a series of gold chrome Pop figures in a special collection that celebrates the first ten years of the Marvel Cinematic Universe. They asked fans to help decide what figure would be added next, but the results were so close that they decided to make two. Behold - The Iron Spider and Doctor Strange Marvel Studios: The First Ten years gold chrome Funko Pops! You can pre-order the Iron Spider figure here and the Doctor Strange figure here with shipping slated for January. If you missed the other Pop figures in collection, you can remedy that right here. On a related note, Funko kicked their holiday lineup off with Marvel heroes in the form of both Pop figures and Pint Sized Heroes! 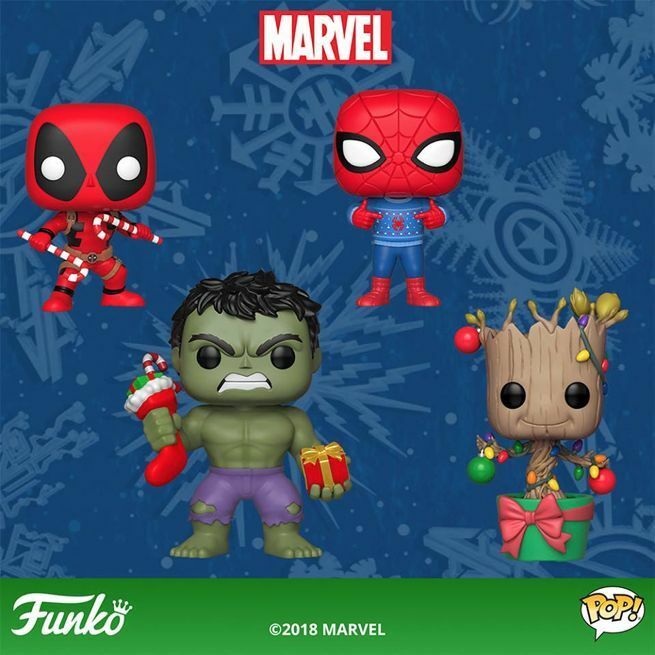 Their Marvel holiday Pop lineup includes Deadpool with candy canes, Spider-Man sporting an ugly sweater, Hulk furiously crushing a stocking (probably because he got a tie instead of a Nintendo Switch), and a Groot Christmas tree that Charlie Brown would be proud of. The Pint Sized Heroes lineup includes, Evil Sweater Thanos, Rocket Sled Raccoon, Christmas Tree Groot, Ugly Sweater Spider-Man, Snowman America, and an adorable Squirrel Girl with a stocking. You can pre-order the entire lineup of Marvel Holiday Funko Pops and Pint Size Heroes right here with shipping slated for November. Finally, Funko Pops aren't the only way that Marvel has been celebrating their decade of dominance. There are also action figures, a special line of clothing, and and epic two volume book set that gives you a behind-the-scenes look at the evolution of the studio "from the 22 movies up through and including 2019's Captain Marvel and untitled Avengers sequel". Marvel Studios: The First Ten Years: The Definitive Story Behind the Blockbuster Studio features 512 pages, 250 color illustrations, and over 100 new interviews with "key producers, studio heads, and cast members including Chadwick Boseman, Benedict Cumberbatch, Robert Downy Jr., Chris Evans, Chris Hemsworth, Scarlett Johansson, Brie Larson, Evangeline Lilly, Anthony Mackie, Chris Pratt, Jeremy Renner, Paul Rudd, Mark Ruffalo, Zoe Saldana, and many, many more." The whole thing comes wrapped up in two hardcover volumes with a slipcase. 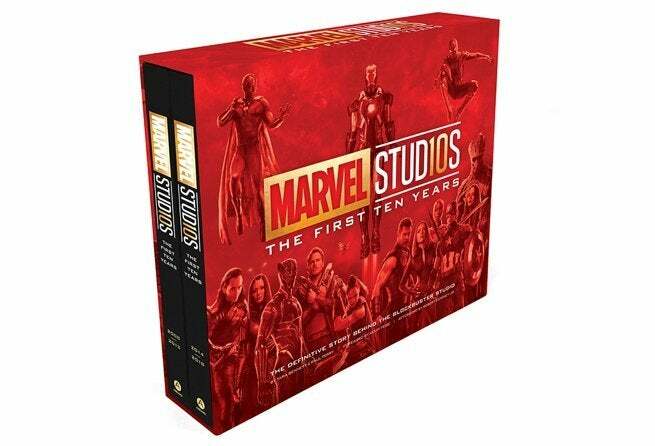 If you're a die-hard Marvel fan with about 12 x 10-inches of available coffee table space, you can pre-order Marvel Studios: The First Ten Years: The Definitive Story Behind the Blockbuster Studio at Target right now for $91.21, which is 39% off the list price. At the time of writing, the book is sold out on Amazon, but keep tabs on that link for a restock. It's slated to ship on May 3rd, the same day Avengers 4 hits theaters. Marvel Studios: The First Ten Years: The Definitive Story Behind the Blockbuster Studio is written by Tara Bennett and Paul Terry with a foreword by Kevin Feige and afterword by Robert Downey Jr.